Sometimes we need one step definition to know about parameter data that was passed to previous steps. There’s 3 ways main ways to do this, each with various considerations. This is the simplest approach. Simply add a private field to your [Binding] class containing your step definitions. In a step, just grab the parameter data and store it in this private field. In later steps, retrieve the data from this private field. This approach is simple but breaks down when we start to refactor our step definitions into multiple step definition classes; the private field data is not accessible between steps in different binding classes. We can store data for the current executing scenario using the ScenarioContext class. This approach can be used even if we refactor step definitions out across multiple binding classes. The scenario context is shared between all steps for the lifetime that a scenario is executing. This approach can start to get a little ugly, we also have to make sure our dictionary keys are correct in all the steps where we set or retrieve data. By default, it’s also weakly-typed – the dictionary just stores objects so we can end up with casts every time we retrieve data. The third method (which I wrote about previously) lets us take a dependency injection style approach, and define POCOs to represent the data (in a strongly typed way) that automatically gets injected into each of our binding classes. Like ScenarioContext, this approach also works across multiple binding classes. Unlike ScenarioContext, we don’t have to worry about dictionary keys or casting. If you’re new to SpecFlow and Gherkin, check out my Pluralsight course: Automated Acceptance Testing with SpecFlow and Gherkin or if you understand the basics or have been using it for a while, check out SpecFlow Tips and Tricks course to learn how to create more maintainable SpecFlow test automation solutions. SpecFlow is a tool that allows the writing of business-readable tests that can then be automated in code. If you’re new to SpecFlow check out my Pluralsight course or the resources page. 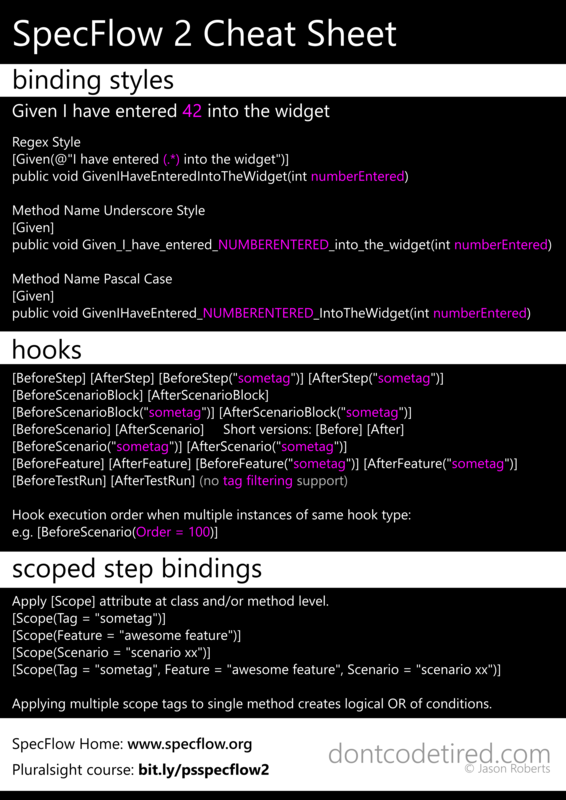 The cheat sheet below shows the basics of different step binding styles, the hooks that can be used to execute additional code, and scoped bindings. SpecFlow is a tool that allows the writing of business-readable tests that can then be automated in code. If you’re new to SpecFlow check out my Pluralsight course or the resources page to get up to speed before looking at these more advanced topics. SpecFlow will attempt to perform some conversions of step arguments as specified in the documentation. When I update the users password to "some password"
In the Given step we get an int specifying how many days ago the user was created. As it’s the Given step we need to put the system into a state where the user creation date, for example held as a DateTime in the user database, is 10 days old. If this is just a single step then we can simply write the code to subtract a number of days from todays date in the step itself. Note: this kind of date based testing where we rely on “now” may prove brittle, imagine the a Given ran just before midnight, but the Then gets executed after midnight, i.e. the next day. Gherkin is a Business Readable Domain Specific Language. It allows the documentation of what a system should do in natural language (multiple languages are supported) and allows test automation code to be written for the system’s features. This cheat sheet outlines the language basics. Step definitions and hooks by default have global scope within the test project. If for some reason we want different automation code to run for each of the “Given A” steps, we could simply reword one of the steps, then we would have two different step definitions. SpecFlow is a tool that allows the writing of business-readable tests that can then be automated in code. If you’re new to SpecFlow check out my Pluralsight course to get up to speed before looking at these more advanced topics. In addition to executing test automation code in step definitions, SpecFlow provides a number of additional “hooks” to allow additional code execution at various points during the test execution lifecycle.